The safety and efficaciousness of modern cell-culture vaccines produced according to OIE standards (see here) currently used for parenteral immunization of dogs are widely recognised. It is therefore not necessary to conduct a serological confirmation of vaccination success. However, in some situations determining rabies antibodies after vaccination may be necessary when evaluating the success of novel strategies (e.g. oral vaccination) or to ensure correct administration and maintenance of cold chain. The determination of rabies antibodies is also required for the international movements of dogs (see Chapter 5 here). Click here to read more on monitoring and indicators of success of oral vaccination campaigns. 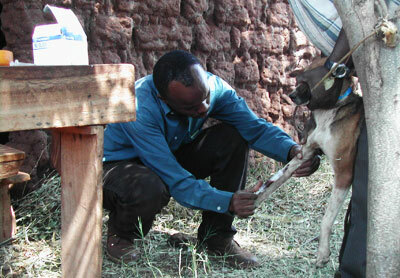 Evaluating antibodies against rabies after vaccination can be operationally difficult and generally requires substantial investment in labour and capital: samples need to be collected pre- and post-vaccination at specific intervals and standard laboratory analyses (measuring neutralizing antibodies) are costly and currently can only be carried out in specialized laboratories (i.e. WHO Collaborative Centers for Rabies and OIE reference laboratories for rabies, listed here). Because of the expense of serological surveys, it is better to use modern efficacious vaccines than risk jeopardizing campaigns with poorer quality vaccines produced by manufacturers not recognized by international regulatory agencies. previous page: 5.6.4. Has the programme had an impact on human rabies deaths, bite exposures and demand for human post-exposure treatment?